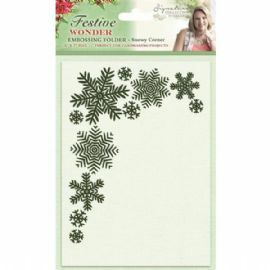 Crafters Companion - Signature Festive Wonder Collection - Snowy Corner 5x7 Embossing Folder - S-FW-EF5-SC. The fabulous Sara Signature Festive Wonder Collection has been personally designed by Sara Davies and contains embossing folders, metal dies, stamps and 3D toppers. It is a complete papercrafting offering for all ability levels, so whether you want to create a really quick card that will take you just a few minutes or spend an evening working on an elaborate creation there’ll be something for everyone with this stunning range of products. This wonderfully festive 5x7 embossing folder is called Snowy Corner and is perfect for adding texture and dimension to your Christmas projects.